The Farnborough International Air Show is not only one of the most famous and best known air shows in the world, it is also one of the world’s most important aviation trade shows. 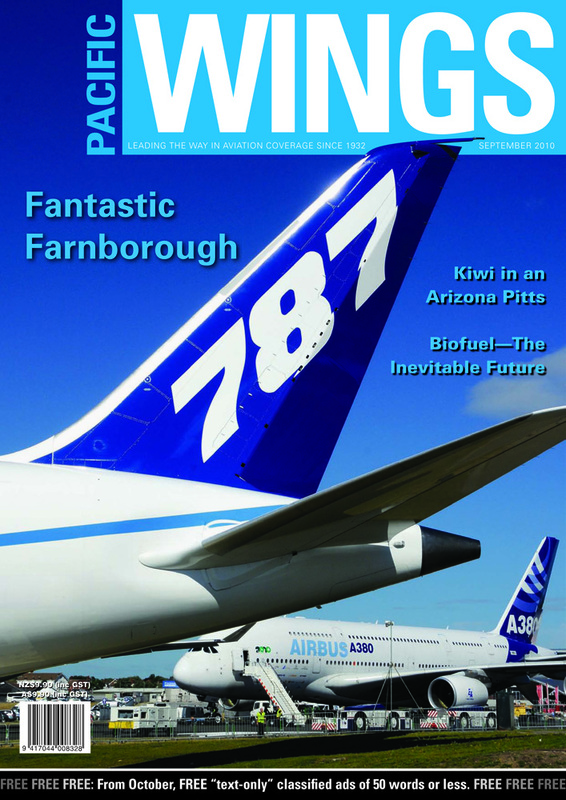 Pacific Wings’ UK correspondent, Peter Cooper—a semi-official Farnborough Airfield historian and photographer—reports on the exciting displays and commercial successes from Farnborough 2010. Air Nelson recently opened a new hangar at its Nelson Airport base—an impressive $12-million facility that will allow it to service Mount Cook’s ATR72s as well as its own fleet of 23 Bombardier Q300s. Rob Neil joined the opening celebration for Air Nelson’s “new shed”. When Simon Davison’s wife asked him where in the world he wanted to go for his 40th birthday, she was a good sport when he announced he wanted to visit Arizona to go flying. Simon tells the story of how Budd Davisson introduced him to flying the legendary Pitts Special. Technical Perspective: Aeronautical Engineering—a Career for the Future? Mike Friend offers some down-to-earth advice and interesting suggestions to anyone who might be contemplating a future in aeronautical design. When Airbus’s “Head of New Energies”, Paul Nash, visited New Zealand recently, he spoke to Rob Neil about the urgency and importance of commercialising sustainable biofuel production.